Shut Down your Computers Automatically with Easy Shut Down Software Utility. Easily Shut Down your Computers with this Shut Down Utility. 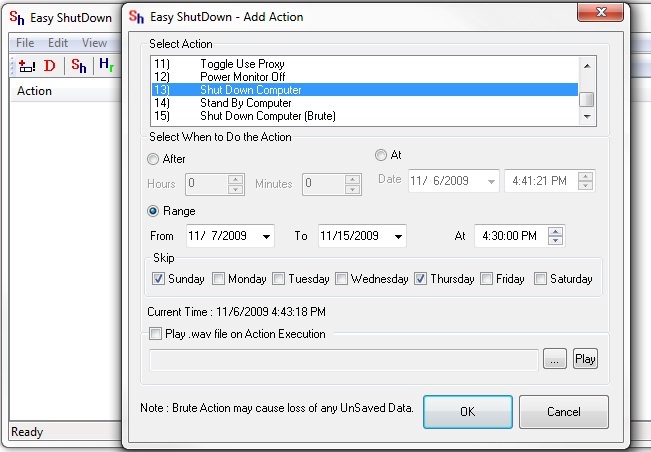 You can Schedule your Computer Shutdown with Easy Shut Down. Lets See how to Create New Scheduled Action to Shut Down the Computer with Easy Shut Down Utility. Download & Install Easy Shut Down Utility on your Computer. Launch Easy Shut Down from your Desktop Shortcut. 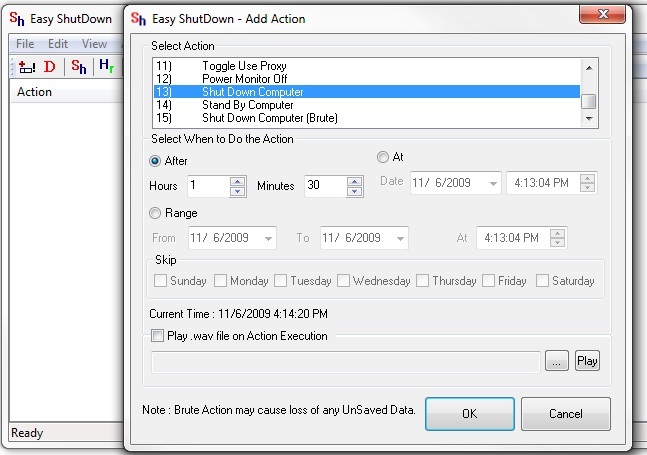 Easy Shut Down Application will Launch Go to File and Select Create New Scheduled Action. Another Window will appear on your Screen. Select the Action from the Window called Shut Down Computer. After and Insert Hours or Minutes after how much Hours or Minutes do you want to Shut Down your Computer. And then press OK to save the Changes to Shut Down the Computer. 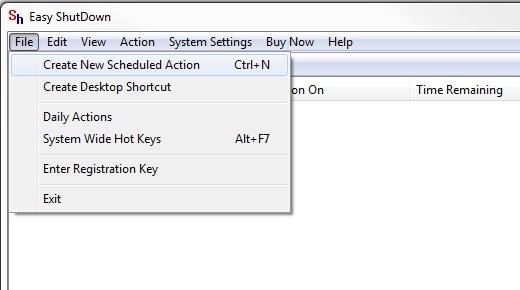 You can also Auto Shut Down your Computer by Selecting the Days on which Day do you want to Shut Down the Computer or on which day you want to Skip Auto Shut Down or you can also Shut Down your Computer Automatically by Selecting the Date from which Date do you want to Shut Down the Computer and to which Date do you want your Computer to Shut Down. For e.g. 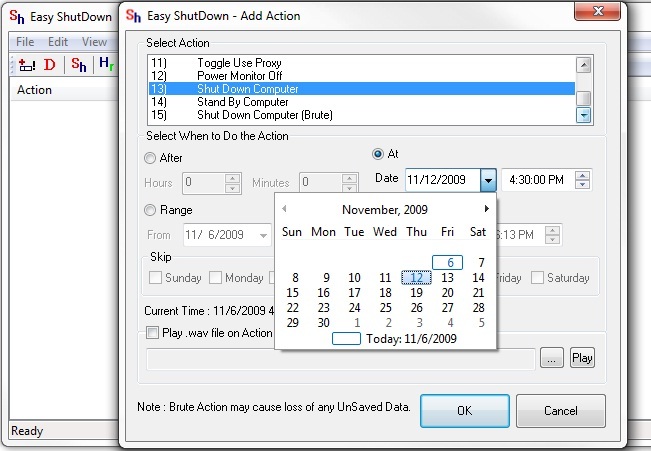 If you want to Shut Down your Computer from 7th of November to 15th of November at 4:30 pm and want to skip on Sunday and Thursday so you can Select the Range option from When to Do the Action and Configure the from which Date to which Date do you want to Shut Down you Computer. And in the bottom of that you can also mark the Days on which day do you want to Skip the Auto Shut Down by Marking on the Date Sunday to Saturday as given in the below Screen Shot.